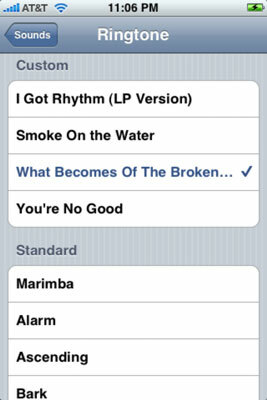 You can choose a distinctive ringtone for your iPhone. Apple has included 25 ringtones in the iPhone, ranging from the sound of crickets to an old car horn. Tap Ringtone to access the list of available ringtones. Flick your finger to move up or down the list. Tap any of the ringtones to hear what it will sound like. A check mark appears next to the ringtone you’ve just listened to. If need be, adjust the volume slider in Sounds. If you’re satisfied, you need do nothing more. Unbeknownst to you, you have just selected that ringtone. If you’re not pleased, you can choose another one.